Harry Reid, what the heck were you thinking? And legal advisors, Democrats, and staff: where were you on this circus? With a clear majority in Congress, a President-elect like we’ve never had before and an inauguration promising to bring out the largest crowds ever, how in the world could a dishonored Governor in Illinois and his antics give the Democratic Party a black eye? Senate Democrats who thought they could push away Roland Burris misjudged the racial fallout, underestimated public reaction and wound up on shaky legal ground. The blunders began when the Democrats, including President-elect Barack Obama, insisted they would not seat Burris as the Senate’s only black member because the appointment came from a governor accused of trying to sell Obama’ former seat. On Wednesday, they all but admitted being outflanked by Illinois Gov. 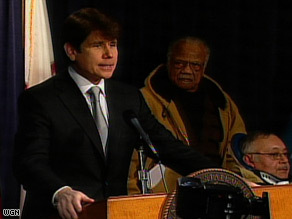 Rod Blagojevich, praising Burris and suggesting he soon will be a senator. Eight days ago, Obama and Senate Democratic leaders saw Blagojevich as so politically damaged that they announced they would reject anyone he appointed to finish Obama’s term. Every Democratic senator signed a letter to the same effect. Privately, key Democrats now admit they miscalculated from the start. They spent this week trying to backtrack and save face. They had overstated their legal powers to block Burris’s appointment, they said, and failed to foresee the ability of Burris—a little-known Democrat with no apparent ties to Blagojevich’s misdeeds—to make himself a sympathetic figure in the national media. Race complicated the matter, with many people asking how Democrats could prevent Burris from replacing Obama as the only black senator. Underlying the Democrats’ initial response to Blagojevich’s appointment was a cold political calculation. Many felt that Burris, who unsuccessfully sought his party’s nomination for governor three times, would be a weak nominee when the Senate seat comes up for election in 2010. Knowing an incumbent senator can be hard to beat in a party primary, Senate Democrats had hoped to postpone acting on Blagojevich’s choice until if and when the governor was replaced, making it possible to put a more potent campaigner in the Senate seat. Now, however, Democratic senators and strategists are reconciling themselves to the possibility of being stuck with Burris. 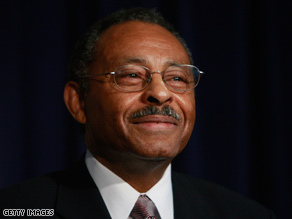 — Last week’s statement on Roland Burris by Democratic Senate leaders. — Yesterday’s statement on Roland Burris by Senate Majority Leader Harry Reid. There were more caves in Washington yesterday than in the mountains of Afghanistan. A week ago, Senate Democrats, with Shermanesque certainty and the backing of President-elect Barack Obama, said that Rod Blagojevich’s Senate appointee would not be seated in the chamber — no way, no how. “It will ultimately not stand,” they vowed. Yesterday, they executed a near-perfect climb down, announcing that they would be happy to have Burris in the Senate after clearing up a couple of minor technicalities — “a pretty easy hurdle to get over,” as Reid put it. New Congress Day 1: Where’s Rahm Emanuel? When Barack Obama picked Rahm Emanuel to be his White House Chief of Staff, we were promised better, smoother relations with the Congress. Today, the President-elect and Vice President-elect both had to phone a Senator who was miffed at a soon-to-be Executive Branch announcement, or as it a leak? “I have been contacted by both President-elect Obama and Vice President-elect Biden, and they have explained to me the reasons why they believe Leon Panetta is the best candidate for CIA Director,” Feinstein said. No matter. Those phone calls were unnecessary and could have been avoided with one phone call from Emanuel to Senator Dianne Feinstein to avoid hurt feelings — yesterday. 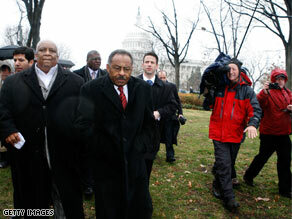 Also at the Senate today, Democrat Harry Reid barred admittance to Democratically appointed Mr. Roland Burris in a scene called a “circus” by CNN. Never mind that Emanuel, Obama, Burris and the Governor who made the appointment, Rob Blagoyevich, are all Democrats from Illinois. You’d think the 24-hour news cycle could have done without news that Dianne Feinstein was not totally thrilled at the Leon Panetta nomination and that Roland Burris had to cool his heels outside the United States Senate. Banana Republics act this way. We have come to expect more from Team Obama. But today was either just an ugly day for Team Obama and especially Leon Panetta or a sign that the honeymoon can’t last. Let’s hope Rahm Emanuael wakes up before the mistakes really count…. Senate Democrats struggled to avert a showdown steeped in race and corruption Monday as a defiant Roland Burris declared, “I’m a United States senator” despite boiling controversy over his appointment to President-elect Barack Obama‘s seat in Congress. Several officials said it was out of the question that Burris would be sworn into office on Tuesday when other new lawmakers take the oath of office. The officials cited incomplete paperwork, but the dispute was far deeper than that. Burris was named last week by Illinois Gov. Rod Blagojevich, who faces charges of having attempted to sell the seat. Burris has not been accused of any wrongdoing, but Senate Democrats expressed the hope that the veteran Illinois Democrat would not violate protocol by attempting to walk uninvited into the chamber. They spoke on condition of anonymity, saying they were not authorized to address the matter publicly. At the same time, Majority Leader Harry Reid, D-Nev., appeared to leave open the possibility of a compromise after having failed to persuade Blagojevich to leave the seat vacant. Burris is scheduled to meet privately on Wednesday with the majority leader in his office a few paces off the Senate floor. Burris, who is black, downplayed the issue of race at a news conference before boarding a flight from Chicago to Washington — even though supporters have given it prominence. “I cannot control my supporters. I have never in my life, in all my years of being elected to office, thought anything about race,” he said. In fact, he is not, and cannot be unless he is administered the oath of office. The defiant move by Illinois Gov. Rod Blagojevich to name a Senate successor to Barack Obama has triggered a political and legal mess that could drag on for months and is already prompting uncomfortable racial questions for Democrats. The case also presents Senate Democrats with a major distraction hanging over their return to Washington this week for the start of the new Congress. Senate Majority Leader Harry Reid (D-Nev.) has made clear that he won’t swear in Roland Burris, the 71-year-old former state comptroller and attorney general who was appointed to the Senate by Blagojevich last week. But Democratic Senate aides are tamping down the idea that Burris would be physically blocked by Capitol Police when the Senate is gaveled into session Tuesday. Burris has said that he will leave upon being denied entry to the Senate chamber. But Reid’s office isn’t backing down on its plan to not seat Burris — and top advisers to Burris are suggesting that Reid doesn’t want an African-American to succeed Obama. “It’s interesting that all those who are viable are white women and the ones who are unacceptable are black men,” Prince Riley, a senior consultant to Burris, told Politico. You are currently browsing the archives for the Burris category.